With the Internet becoming more important with each passing year, live chat services have begun to replace more traditional forms of customer service. Many consumers still prefer contacting companies by phone or in person, but among Millennials and younger generations particularly, the Internet is the preferred method of communication. Call center live chats allow consumers to talk directly and instantly with your company over the Internet. Call centers now offer a range of services not just limited to the phone. With live chat outsourcing service, a call center provides customer service agents, as usual, but allows them to also communicate with your customers through an instant messaging system. With a live chat service, customers who go to your web site can instantly speak with a live customer service representative. By simply submitting a comment, they can receive an instant reply and engage in a conversation with the live service agent. Most Millennials and younger customers will prefer live chats to over-the-phone communication, but there are many other benefits to these services as well. Here are some of the top benefits to using live chat service providers. For any business, one of the main concerns with customer service is being able to effectively handle customer complaints and queries. A high volume of calls can lead to clogged phone lines and long wait times. Not only can this cause a business to lose customers, but it’s not efficient or cost-effective. By diverting some customers onto live chat services, you can more efficiently resolve complaints and questions, providing all-around better customer service. Many types of questions or complaints aren’t suited to the phone. For detailed or highly specific questions and concerns in particularly, live chat services are more effective. Customers can instantly start a conversation whenever they like and can continue it on their own time. It’s a more convenient option for your customers. By integrating live chat services with an online e-store or web page, you can easily increase conversion and turn Internet users into paying customers. Live chat services give people an easy-and-quick option to inquire about your services or products and resolve any concerns preventing them from making a purchase. About 70% of all purchasing decisions are made at the point of sale, so live chats can greatly increase a business’s revenue. One of the major benefits of live chat support is that it gives your business dedicated, 24/7, around-the-clock service. With live chat support, a customer service agent is always available to handle queries and questions from your customers at any time of day. There are many click-to-chat benefits; with live chat support services, businesses can ensure dedicated service and the highest level of customer support. More prompt and efficient responses are one of the biggest live chat advantages. Live chat is more efficient than other forms of communication, allowing customer support agents to quickly and easily respond in real time to customers’ concerns. With live chat, there are fewer queues/shorter waiting times for the customer, and call center agents can handle a higher volume of customers than over the phone. If you’re wondering why live chat is important for many businesses, one common reason is that it is one of the most cost-effective customer service solutions. Not only is live chat more affordable to implement than many other types of customer service, it can also directly increase sales. Many consumers will use live chat to quickly answer questions before making a purchase or business decision. Studies have shown that customers are more likely to make a purchase after using a live chat. When it comes to standing out from your competition, using a live chat support service provider can make a huge difference. By using live chat, businesses can provide a superior level of service and accessibility to their customers that differentiates them from competitors. While having live chat can immediately improve a business’s image in the eyes of consumers, it can also allow businesses to foster better connections with their customers and create new business opportunities. By fostering relationships with their customers, businesses can increase customer loyalty and grow their base of customers. The business use of live chat can help with improving customer relationships. Customers develop connections to companies that are accessible, provide good service, and do not take their business for granted. Live chat helps with all of these points. One of the biggest benefits of live chat customer service is that it can directly address consumers’ concerns, questions, and issues, thus encouraging more purchases and sales. When a consumer is considering making any type of purchase, there are concerns that they may have, which can impede sales. With live chat, your business can directly address these concerns, helping to turn skeptical consumers into paying customers with your business. 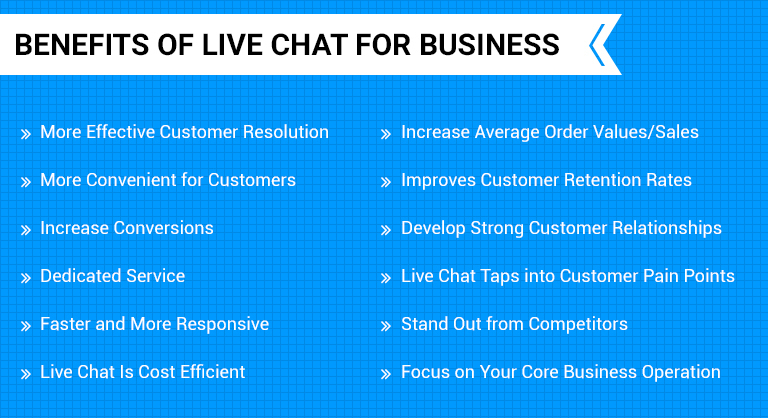 By using live chat support, businesses can increase average order values. Live chat can directly increase sales; by addressing customers’ concerns and questions, live chat can lead to conversions. Furthermore, with live chat support, businesses have an avenue for upselling, cross-selling, and other sales techniques that can increase revenue even more. When live chat support is used correctly, customers are more likely to spend greater amounts. Customer retention is one of the most effective ways to grow a business and increase sales. People who have already done business with your company are much more likely to make more purchases in the future. This is why fostering better business relationships with your customers can be much more effective than traditional marketing methods. Live chat support provides a higher level of service to your existing customers, helping improve relationships and increase customer retention. By using a live chat support service provider, business owners can focus on their core business, redirecting both their time and money into other important business functions. When outsourcing live chat support, businesses gain highly professional customer service for affordable rates. This means cost savings, increased sales, and renewed attention into other areas of the business other than customer support. 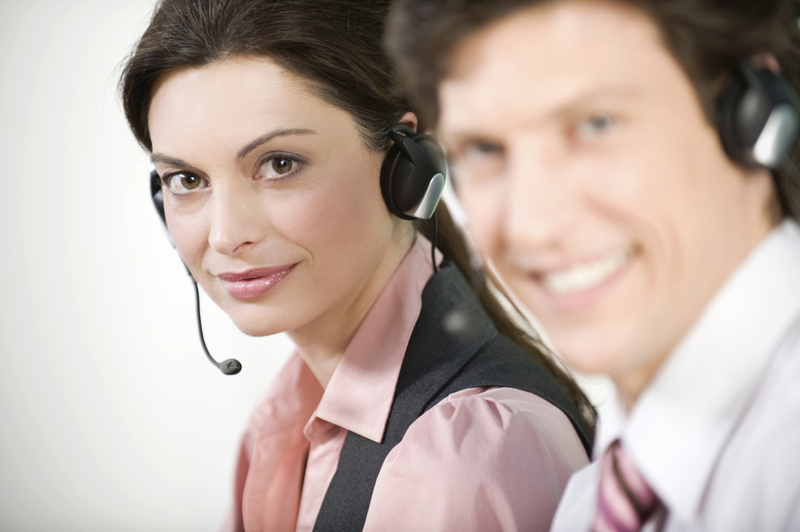 3C Contact Services offers live chat services as a fundamental part of its operations. Our live chat service has two main benefits, which we provide by allowing our trained agents to handle multiple customers at once through different platforms: we can resolve customer concerns more quickly, and we can save your business money in the process. 3C Contact Services offers both shared and dedicated agent services to meet the needs of any business. Our agents are trained professionals who can match the tone and branding of your business, integrating your image and marketing with customer service. To offer good live chat support, there are three fundamental things to follow. Part of the appeal of live chats is that there is no waiting time involved. When a customer opens a chat, an agent must speak with him or her immediately. Because live chats are occurring over the Internet, it can be more difficult to add that personal touch. The agent’s name and picture should be used to make the interaction more personal and friendly. Live chats offer the perfect opportunity for upselling, cross-selling, and direct marketing. They are a great way to boost sales, and these services can all be integrated easily and non-intrusively in a way that can’t be done on the phone. 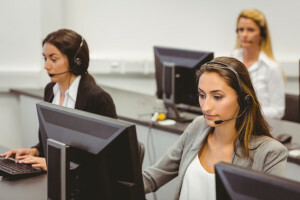 As the leading provider of outsourced call center solutions, 3C Contact Services teaches its partners the necessary customer service skills needed to engage and retain customers. Call us today at 1-888-353-2335.